This weekend, the former Russian colony, Fort Ross, located in California celebrates its Bicentennial with dignitaries, envoys, tourists and locals. This weekend, Fort Ross, the historic Russian settlement in California, will celebrate its bicentennial. The breathtakingly beautiful park, with its rustic wooden architecture and verdant natural beauty, has had a year chock full of lectures and performances, all culminating in this weekend’s festival. Fort Ross very nearly did not make it to the ripe old age of 200, however. The fact that it is still open, when so many California public parks are suffering—and Fort Ross itself was slated for closure--is reason enough to put on a big party. Fort Ross is also a huge source of pride for Russians, who established a social community with Indians, Mexicans and Americans in California. Unfortunately the history of Russian exploration of America is not a well-known subject in the U.S. and Russia. According to historians, it was an era of friendship. “This period of our common history should be the basis for improvement of the ties between our countries,” said Vladimir Vinokurov, who heads the Russian General Consulate in San Francisco. Fort Ross, a fortress 80 miles north of San Francisco, was founded in 1812 by Russian colonists. Two centuries later, this site represents one of the most vivid examples of Russian-American history and is a National Historic Landmark. Historic records show that by 1824, when Russians colonized a small stretch of California coastline, there were about 400 Russian families doing trade and fishing as well as agriculture. Russians were cultivating wheat. They hired members of the local Indian tribe Kashkai. Initially the compound was armed with 10 cannons and this number increased up to 40 by 1840. However due to the high cost of increasingly difficult logistics between Saint Petersburg and the Russian outpost on American soil, the Russian-American trade company sold Fort Ross to an American landlord named John Sutter in 1841. The cultural program of the 200th birthday includes performances by Pyatnitsky Russian Folk Choir and Children's Cossack Choir as well as authentic Russian and Mexican music, costumes, games and dances. International, national and local dignitaries are expected to address Fort Ross’s significance for promoting Russian-American ties. The Russian Ministry of Foreign Affairs and Ministry of Culture representatives, as well as Mikhail Shvydkoy, the Russian president’s envoy for international cultural cooperation, will be visiting the 3,400 acre park. California’s governor Jerry Brown is also expected to pay a visit. It is now hard to imagine that Fort Ross State Park was almost shut down three years due to the state of California’s budget crisis. Arnold Schwarzenegger, then governor, managed to find a way to keep public financing flowing to the historic site thus preventing it from closure. Russia's Ambassador to the U.S. Sergei Kislyak also took a great interest in saving Fort Ross; his staff said he will also attend the event. U.S. Ambassador to Russia Michael McFaul is also expected. Fort Ross is where he asked his wife to marry him, he said in a recent interview. According to Potemkin, Fort Ross stands today as a strong reminder of the mutual respect Russians and Americans held for each other. 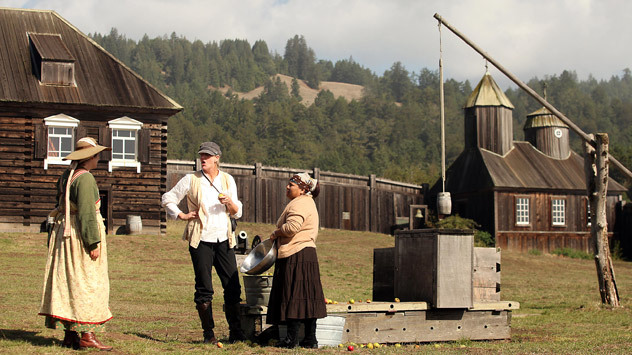 "The 200th Anniversary celebration of Fort Ross focuses well-deserved appreciation and attention on the early Russian settlers in America, and we must keep and build on that spirit of trust and understanding they left to our care," Potemkin told RBTH. Alexander Gasyuk is Rossiyskaya Gazeta’s Washington D.C. correspondent.